Well … maybe, but maybe not. Although sneezing in cats sick cat symptoms, it is best to be aware of possible reasons. The common causes for lots of sneezing can range from minor, to extremely serious. 1. Foreign Object — Cats naturally being curious, it is quite common for a feline to inhale something like dust or pollen in their many wanderings. After enough sneezing, it should pass and the cat will be back to normal. 2. Feline Asthma/Allergies — Cats can have asthma or allergies, just the same as humans. Dust, mold, or pollen are common allergic irritants; and many cats react to mold without even having an allergy to them. 3. Dental Problems — As surprising as it may be, sneezing in cats can be caused by mouth, gum, or dental problems. This is because the nasal passages are extremely close to the mouth, and thus one problem may cross to the other. Check for soreness, and sometimes if a cat with gum disease is offered a toothbrush, it may grab it and attempt to chew it to clean their teeth themselves. 4. Infection — A cat sneezing a lot may be suffering from infection of the upper respiratory system, or of a form of fungal infection in their system. Watch for other symptoms that signal infection, such as fever or vomiting. 5. Illness or Disease — Just as with humans, sneezing in cats can also be an indicator of much more serious disease. 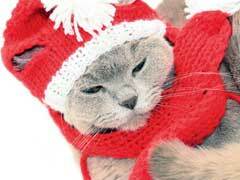 Nasal cancer in cats causes sneezing, as does feline leukemia and feline herpes. If you see that your cat’s sneezing is accompanied by other symptoms, or if you are simply concerned for your sneezing pet, do not hesitate to consult a veterinarian.